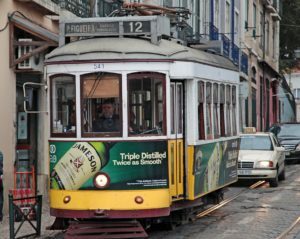 With Eurovision being held in Lisbon for the first time, one may need some guidance on how to get around in the city. Here’s some information you may find useful to plan you trip in regards to transportation. For the first time ever, the Eurovision Song Contest will be held in Lisbon as Portugal won the contest for the very first time last year with Salvador Sobral’s Amar Pelos Dois. Every year, a big amount of Eurovision fans travel to the host city so they can witness their favorite music show live. While planning a trip to Sweden may not be as hard as the country has won so many times, a trip to Lisbon may not be as simple as it is an entire different universe to many Eurovision fans. Underground: the service starts at 06:30h and closes at 01:00h every day. Each ticket costs 1,45€ per person but if you have to buy the rechargable card (Viva Viagem), it adds 0,50€ to its final price. Tickets are purchased in automatic ticket vending machines right before the underground entrance. You can check its network online. Bus (Carris): if you prefer to take a bus yet not pay as much, there’s other alternatives such as the buses numbers 705, 722, 744 or 783. If your flight arrives at night, then bus number 208 is your alternative. The respective schedules can be found in Carris website. Taxi: there’s a high taxi network standing right outside of the airport. In busy periods, you may need to wait a few minutes to get one. Friendly tips: Get the card Viva Viagem as soon as you get to Lisbon as it is rechargable and will allow you to use Zapping with all different types of transportation: underground, bus, train and even boat. For each transport, the price charged changes (more info here). Altice Arena is located near the train station, the underground station Oriente and even a bus terminal. You can use all of those to get to the arena. If you’re staying in central Lisbon, the underground service will be your best option but if you’re staying in an Airbnb apartment not as central, other means of transportation would be more useful. Once again, we’d recommend the usage of Zapping. Underground: Altice Arena is located in the Oriente station (red line). Please notice that the Arroios station is closed. It would take you less than 10 minutes walking to get to the arena. Train: it may be within your best interest to use the train if you’re staying in Sintra or Azambuja lines. For Cascais line, it is not as simple. You’d have to take the train to Lisbon and then the underground to Oriente’s station. Again it won’t be 10 minutes from the train station to the arena. Bus: the buses 705, 725, 750, 759, 794, 400, 706, 728, 744 and 782 all stop near the Oriente train station. It will take you less than 10 minutes walking to get to the arena. With your card Viva Viagem and Zapping, you can go anywhere as long as it is charged and use any mean of transportation. For central Lisbon, the underground will serve you better. The service is more frequent and it is also the fastest alternative. The buses and the trams could also work for you if you prefer to view the city instead and have no rush. If you want to explore more than Lisbon, for example Cascais or Sintra, the train is your best option. In the respective locations, there are specific local buses that you can also use. We certainly hope this article helps you on how to plan your trip properly. More articles to guide you through Lisbon are yet to come. Stay tuned!